Motherboards featuring AMD's new AM4 socket have been spotted in the wild, giving us a first look at the socket that supports both seventh-generation Bristol Ridge APUs, and AMD's long-awaited Zen CPUs. 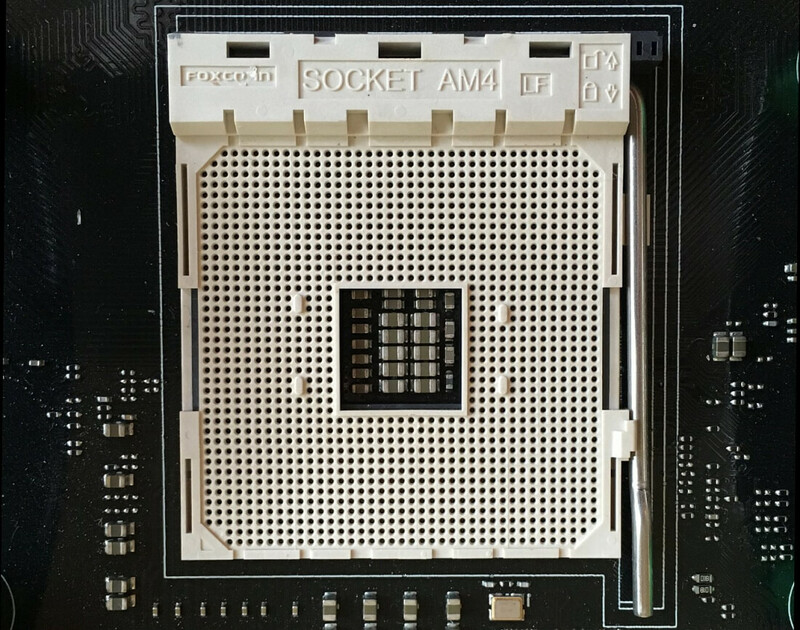 The AM4 socket looks reasonably similar to AMD's previous processor sockets, featuring 1331 pin holes arranged in a plastic mount. It appears as though AMD will continue to put the pins themselves on the CPU, which does increase the risk of accidentally bending a pin during the installation process, but shouldn't be an issue outside of that. New coolers will be required for AM4 systems as AMD has changed the cooler mounting layout, rendering AM3 coolers useless without an update to the mounting hardware. Considering AM4 is a major update to AMD's motherboard platform, this isn't too surprising. While AM4 motherboards from partners haven't hit the shelves yet, an OEM AM4 motherboard from HP has been spotted inside a new Pavilion desktop. Enthusiasts who want to mess around with AMD APUs and DDR4 memory can purchase the HP 510-P127C, where a micro-ATX HP 'Willow' motherboard can be found inside. The board itself is fairly limited in its expansion support, with just a single PCIe x16 slot, two DDR4 slots, and a serious lack of SATA ports. This board does support the new features of the AM4 platform, like PCIe 3.0, however there's no USB 3.1 ports to be found. Announced way back at CES 2016, AM4 is AMD's new socket that supports both seventh-generation 'Bristol Ridge' APUs along with upcoming 'Summit Ridge' Zen CPUs. Previously, sockets for APUs (FM2+) and CPUs (AM3+) were different and incompatible with each other, however AM4 allows users to purchase a single motherboard today for a 7th-gen APU and then upgrade it to a Zen CPU when they become available.